Apolipoprotein B mRNA-editing enzyme catalytic polypeptide-like 3 (APOBEC3) proteins are a family of cytidine deaminases that play important roles in diverse physiological processes in humans. APOBEC3-driven cytidine deamination results in a C-to-U conversion in target nucleotides, classifying this biological activity as a DNA-/RNA-editing mechanism. In recent years, biochemical, cellular, and bioinformatics studies have supported a role for APOBEC3 proteins in the etiology of human cancers, based on their ability to mutate genomic DNA. 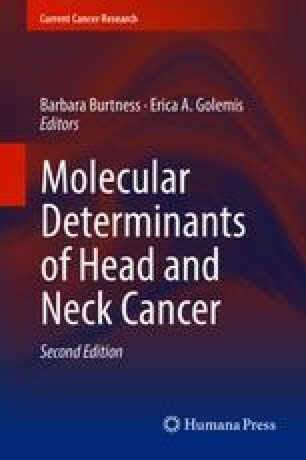 In this chapter, we provide a thorough review of recent studies that have implicated APOBEC3 in a number of diverse cancers, including head and neck cancers. These studies suggest that APOBEC3-dependent mutations are most associated with squamous cell carcinomas of the head and neck and may be linked to human papillomavirus (HPV) expression and production of neoantigens. Cell-based and structural evidence corroborates the initial bioinformatics data on APOBEC3 function. In conclusion, we raise several prospects for targeted therapeutic avenues including potential immunotherapy options that can leverage neoantigens generated from APOBEC activity. Burtness B. The tumor genome in human immunodeficiency virus-related head and neck cancer: exploitable targets? Cancer. 2017. https://doi.org/10.1002/cncr.31059. Vieira VC, et al. Human papillomavirus E6 triggers upregulation of the antiviral and cancer genomic DNA deaminase APOBEC3B. mBio. 2014;5. https://doi.org/10.1128/mBio.02234-14.